Below is a list of our officer rate. For Patrol Rates See the patrol page. As Low as $120 per hour, Per Officer, plus room & food expenses paid by the client. Attire consist of Black button up shirt with badge. Attire consist of Polo shirts and dress pants. Guards generally carry non-lethal devices, 2 way radio, and handcuffs. Attire consist of Polo shirts and dress. 3. Undercover: "Plain Cloths" dress; casual or professional. 4. Armed/Unarmed: Officers will only be unarmed if there is significant evidence that no physical harm threat exists. All Officers are required to wear duty belts with self-defense measures during all alcohol related events. Guard rates will reflect armed or unarmed Officers. When we state "armed" we mean the Officer will be carrying a firearm in holsters with multiple safety features. "Unarmed" Officers/Guards may carry Asp (Baton), OC spray (Pepper spray), Tazer, handcuffs, flashlights, multi-tools, etc.  All Guards/Officers working for Jackson County Security are thoroughly trained in the use of all items they carry.